Rainforest Action Network, BankTrack, Indigenous Environmental Network, Sierra Club, Oil Change International and Honor the Earth recently released the Banking on Climate Change – Fossil Fuel Finance Report Card 2018. The results aren’t encouraging. 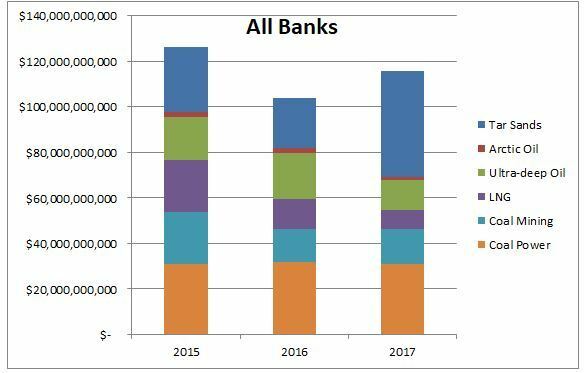 Banks increased what the group dubs “extreme fossil fuel financing” in 2017, more than doubling finance for tar sands companies and pipelines (up 111% year-over-year), according to the report, which was endorsed by more than 50 organizations worldwide. JP Morgan Chase was the single largest financier of extreme fossil fuels last year, earning a D+ for its financing of tar sands projects and companies. Two other leading US banking groups – Goldman Sachs and Morgan Stanley – merited grades of D+ as well. Three of Canada’s “Big Four” banking groups fared worse. Bank of Montreal, CIBC and Scotiabank earned grades of D-. TD Bank earned a D, while RBC received a grade of D+. Chinese and Japanese banks received the worst grades. Agricultural Bank of China, Bank of China, China Construction Bank, ICBC, and MUFG all earned F’s. European bank groups fared best. BNP Paribas earned the highest grade regarding 2017 tar sands financing with a B. BPCE/Natixis and ING earned a B-. Credit Agricole received a grade of C+. 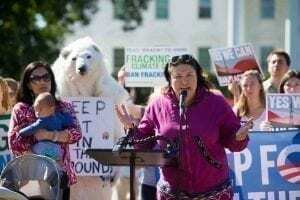 A coalition of more than 400 organizations and leaders deliver a historic letter to the White House on Tuesday calling on President Obama to stop new federal fossil fuel leasing on public lands and oceans in the United States. In addition to tar sands finance, the consortium of environmental/human rights organization’s graded banks on financing of Arctic Oil and “Ultradeep,” LNG export, coal mining and coal power. “[I]n spite of the urgent climate crisis and deadly human and ecological effects, this report finds that 2017 was a year of backsliding,” stated Alison Kirch, climate and energy program research coordinator for Rainforest Action Network. An interactive, online database lies at the core of the “Banking on Climate Change – Fossil Fuel Finance Report Card 2018” website. “A handful of banks have published policies restricting their financing to some of the most carbon intensive, financially risky, and environmentally destructive fossil fuels. But as these grades show, banks have a long way to go to align their businesses with climate stability,” the environmental groups write. The site also includes three case studies illustrating how the world’s biggest banks’ continue to spur greenhouse gas emissions, global warming, and environmental resources degradation by continuing to lend, invest and raise billions of dollars per year to finance fossil fuels exploration, production, distribution, and consumption. 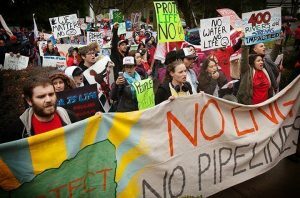 The case studies report on the Line 3 Tar Sands Pipeline, the Jordan Cove LNG facility and social injustice and indigenous rights violations in Alaska associated with bank financing of climate change.